Looks Good from the Back: Beauty Review: Pixi + Caroline Hirons Double Cleanse. 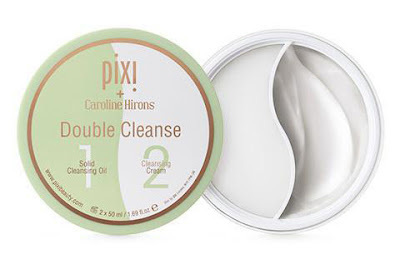 Beauty Review: Pixi + Caroline Hirons Double Cleanse. If you've been reading this blog for a while you know I am a fan of Caroline Hirons and of her methods. She's bossy and opinionated but that's exactly why I like her. My local Target didn't have the Double Cleanse in stock and I'm far too lazy to be driving around looking for it so I ordered it from the Target website. I have a Red card which got me free shipping because you know I hate paying for shipping. I've been using the Double Cleanse for about a week and I'm quite impressed with both products. The solid cleansing oil side is nearly identical to Clinique's balm cleanser (of which Hiron's is a fan) but is very slightly silkier and it does a really good job of getting off my makeup. The cleansing cream side is nice too, though I have to use a fair portion of it to get my face clean. I'm not used to cream cleaners so it takes a bit of getting used to. Neither product is drying at all and both are unscented which I really like. My only real negative about this product is the price for the amount. For $24 I am getting two half-size products - 50ml of each. For only a few dollars more I can get 125ml of Clinique balm cleanser! I'm ripping through this yin yang of Pixi cleanser pretty quickly and I don't know if it's amazing enough to replace my tried-and-true. Also! Don't buy this on Asos (not an affiliate link) because for some insane reason they're charging $37 which is criminal. Geez. Anyway, do you double cleanse? If so, what products do you use? I really love it except I'm already out of the cream part and have way more of the oil left. I actually wish Pixi would make just the cream cleanser to buy separately. I have other oil cleansers that I use and like as much, but the cream cleanser is so good.I just ordered the Oskia Renaissance cleanser. I'm interested to see how I get on with that. It does a good job of removing my makeup and isn't drying.